Erstaunliche 9BR, 8. 5BA, Blick auf den See, Chefkochküche, Whirlpool, in der Nähe von Heavenly! "Atemberaubend!" ... "Spektakulär!" ... "Unglaublich gut ausgestattet" ... "Tolles Hotel in toller Lage" ... "Hervorragende Gastfreundschaft ..."
Dieses atemberaubende Haus mit herrlicher Aussicht verfügt über 9 Schlafzimmer und 8. 5 Bäder. Ihre Gruppe wird besonders von der voll ausgestatteten Gourmetküche, der privaten Umgebung und den super bequemen Betten begeistert sein. Deshalb hat dieses Haus 70 FIVE STAR REVIEWS verdient. 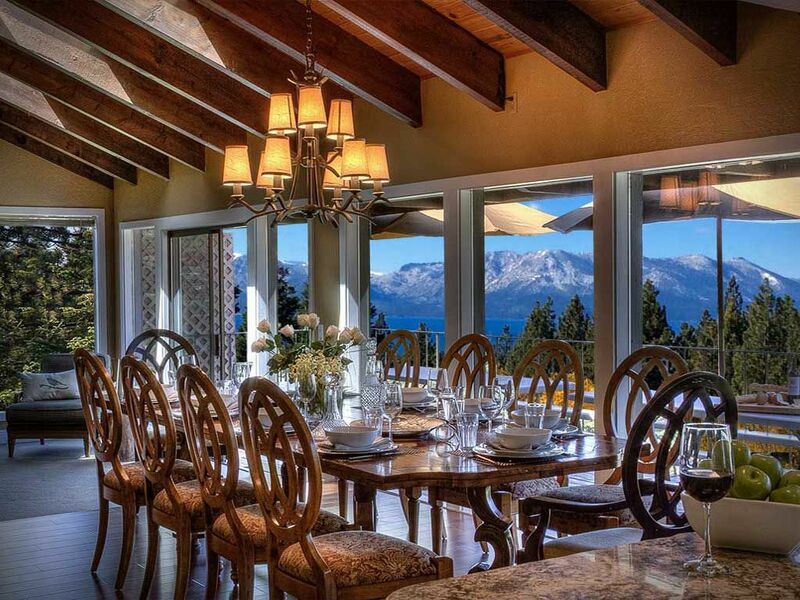 Dieses 5-Sterne-Haus befindet sich in idealer Lage, nur 1,6 km von der Heavenly Ski Gondola, den Lake Beaches, Einkaufsmöglichkeiten, dem Casino und dem Edgewood Golf Resort entfernt. Die Nähe des Hauses spart Zeit, die Sie zu Ihren Reisezielen benötigen. ✮✮WINTER-GARANTIE ✮✮ Mit unserem schnellen und zuverlässigen Schneeräumungsservice gestalten wir die Pisten problemlos. Eine angeschlossene Garage und eine ebene Zufahrt sind für Ihre Sicherheit unerlässlich. Keine gefrorenen Schritte oder große, rutschige Hügel, um an einem verschneiten Tag zu navigieren. ✮✮WINTER GARANTIE Mit unserem schnellen und zuverlässigen Schneeräumungsservice sorgen wir dafür, dass Sie problemlos auf die Piste gelangen. Eine angebaute Garage und ebene Einfahrt ist für Ihre Sicherheit unerlässlich. Keine gefrorenen Schritte oder große, rutschige Hügel, um an einem verschneiten Tag zu navigieren. Great place for a group of families! We had a great time at this home. It is well-maintained with lots of space and amenities like baby gates that make this place convenient for folks with kids. Everyone on our trip enjoyed this home very much. Great house, location and amenities! Great house, location and amenities! Simple check in and check out process! Great views! We stayed in this cabin for a full week with a large group, our family that consisted of adults and children. The moment we stepped inside the cabin we knew we will have a great time. The cabin is very large and has everything you could possibly need for a comfortable stay. Our favorite was probably the fact that the living room, and kitchen and the pool table area are all somewhat connected and you can be in the kitchen prepping lunch but also not missing out on the fun around. Another thing we liked and was very convenient is that all the bedrooms were below the main level and when it was time for children to go to sleep, they were able to do that without hearing much of the noise upstairs. The kitchen is a dream kitchen! Has all the appliances needed for a large group. We brought a few items with us like a large pot and thought we might need smaller appliances like a coffee grinder for example, but none of that was needed and was provided at the cabin. Hearing feedback from our entire group, we enjoyed our stay and the beautiful views from the large windows on the main level. We did not have any issues but even if we were to, we knew that Gerard was very prompt and quick with communication and just a phone call away. Definitely recommend this cabin! You will not regret booking this home! Very well equipped, great amenities, plenty of room, bedding, kitchen supplies, towels, games. Great location and view. Recommend. Communication prior to visit was excellent. Likely to return next year! I reserved this location for a Leadership Retreat for my managers. They were very pleased with the experience and the site. No issues, clean, the property manager was very responsive. Likely, we will return for future retreats. Recommended. There are no words to express how much we loved this house. We had family and friends up to Tahoe for a vow renewal on the Safari Rose sunset cruise (totally wonderful too). This home was spacious, comfortable, and extremely beautiful. There was not a single thing I would have changed!!!!! THANK YOU SO MUCH!!!! Thank you for taking time to enhance our online reputation. Good for you for making such great memories in a beautiful setting with those closest to you!